The Constitution establishes the Supreme Court as the highest judicial power of the federal government. As it was originally established in 1789, the Supreme Court had one chief justice and five associate justices. The number of justices on the Supreme Court has changed since its inception, and in 1866, Congress passed an act that stipulated a total of nine justices, one for each of the nine judicial circuits in the country. The Supreme Court has original jurisdiction in cases involving states and diplomats. The Supreme Court has appellate jurisdiction over virtually any other case involving a point of law. Congress may also ask the Supreme Court to prescribe rules of procedure, which lower courts must follow. The president of the United States has sole power to nominate Supreme Court justices. There are no professional requirements for justices, but they are often attorneys who have also served as lower-level judges. Justices have some law training, typically as a lawyer. The Senate must confirm the president's nomination to elevate a new justice. Justices hold their offices indefinitely, until they retire or die. The federal court system's highest court is the Supreme Court. Under the Supreme Court, 13 regional circuit courts of appeals house 94 judicial district courts that handle appeals cases at the district level. Every state has at least one judicial district court in it. District courts have jurisdiction over a wide variety of federal civil and criminal cases, including personal injury cases. 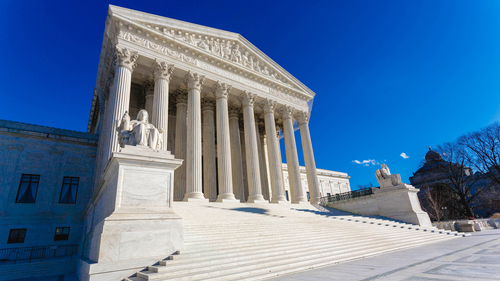 The Supreme Court hears a number of cases each year, some of which enter the court system in state or federal courts and most of which usually involve key questions of law. After a case has been ruled upon by a state supreme court or a circuit court, an attorney with either party may appeal the decision to the Supreme Court. Appealing a case to the Supreme Court involves filing a writ of certiorari to ask the court to hear the case. The court may or may not accept the case. If the court does not accept the case, the existing ruling stands. If the court accepts the case, petitioners can submit briefs and conduct oral arguments. Most cases brought before the court are not accepted to be heard. In fact, fewer than 1 percent of the appeals are heard by the Supreme Court. The Supreme Court is housed in the Supreme Court Building in Washington, D.C. This building has been the home of the Supreme Court since 1935, when Chief Justice William Howard Taft led the process of designing and erecting the building. The Supreme Court hears cases during its annual term, which begins on the first Monday of October and lasts through the end of June. To decide a case, a quorum of six justices needs to hear the testimony. Justices can listen to recorded oral arguments and read transcripts if necessary. The Supreme Court has ruled in a number of historic landmark cases in its tenure. In 1857, the Dred Scott decision by the Supreme Court upheld a ruling that slaves were property, having no claim to legal rights in America, a decision that laid part of the groundwork for the Civil War. The Brown v. Board of Education decision in 1954 ruled that states had to end public school segregation. In 1973, Roe v. Wade gave women the right to choose whether to end a pregnancy. In 1974, the Supreme Court ruled that a president can't withhold evidence in a criminal trial citing executive privilege. In the highly contested presidential election of 2000, the Supreme Court ruled against a recount, stating that it wasn't possible to complete the process in a reasonable period of time. Visit our homepage for more information regarding Chicago personal injury attorneys. How Is the Court System Organized in the United States?